This unique windchime features 72 glass marbles in a mix of iridescent emerald and pale green cat's eye, each individually hand-wrapped in solid copper wire with an enamel finish (to retard tarnish). The top frame is solid aluminum so there's nothing to rust. It is accented with 8 natural Fluorite cleavages. When formation occurs under high temperature, Fluorite forms 8-sided (octahedral) crystals. Pure Fluorite is colorless; it's the minor impurities present that cause various colors ranging from pale green to intense purple. And, for the hippies in the audience, Fluorite will glow under a black light...which is where we get the word "fluorescence". Metaphysically, Fluorite is believed to encourage self-worth. It is also seen as an aid to master physical skills & to improve dexterity as well as supporting healthy bones and physical structures of all organs. 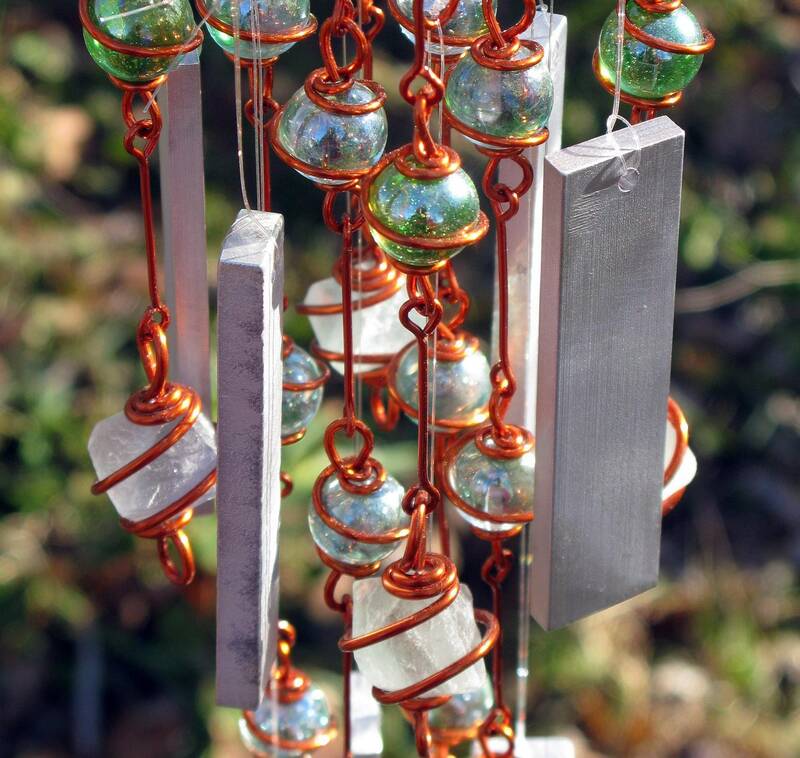 As these are natural stones, the sizes of the Fluorite crystals will vary from windchime to windchime. To hear my chimes, please visit my YouTube channel at http://www.youtube.com/user/TapestryArabianFarm. To see more of my windchimes, please click here: https://www.etsy.com/shop/tapestryarabianfarm?section_id=5359119&ref=shopsection_leftnav_5.